Competitors, be sure to read the rules. Parking - Street parking is only available. Arrive early for best parking. How best to celebrate friendship and family than to share in the love with your specialty dish or pre-made favorites from your grocer or restaurant. In the usual Rib Fest fashion, guests are asked to bring a dish or side dish. 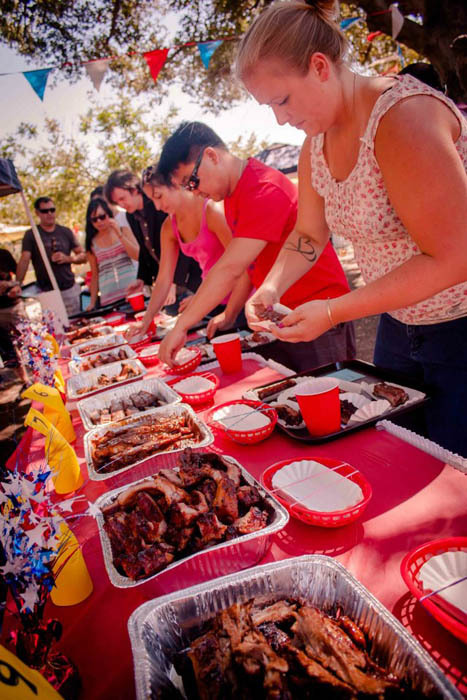 Cook off competitors are not required to bring a dish other than their delicious ribs! Partake in the Rib Feasting! Prizes will be given to the winner of each category. We may or may not accept new competitors after the July 17th deadline. You must submit a minimum of 20 individual ribs or pieces (enough ribs for judges) per recipe entry--maximum of 3 recipe entries per competitor. Please have you're racks cut into separate ribs before submitting. You are encouraged to bring more ribs so that non-judges can have a taste of your awesome ribs! See more about judging below. Ribs must be submitted in standard half-sized* aluminum serving pan(s) and covered with foil. These will be available at the park. Be prepared for us to move your ribs to a standard pan if you don't have one. We need to do this to try and keep contestants anonymous. * Standard half-size is about 11 3/4" x 9 3/8"
Submit in 11 3/4" x 9 3/8" pan (with no handles) and cover with foil. Competitors will be announced on the Facebook event page. We would like a reasonable number of competitors for the competition, 5-12 contestants. To keep it fun, we want to encourage participation but we will use our discression if we receive too many competitors for our judges to make effective decisions (This situation most likely will not happen.). NO store-bought, ready-to-eat, or ready-to-heat-and-eat ribs allowed. Ribs must be made and cooked by the competitors. Besides individuals, cooking teams and partners are allowed to compete. You can make your ribs at home or bring your grill to cook at the park. Please see "Available at the Park" section. You may arrive at the park with your grill as early as 10 AM to cook ribs if you do not want to cook them at home. Again, please see "Available at the Park" section. By 3 PM, your ribs must be handed to the warden. DO NOT bring glass bottled beer or glass bottled drinks. Beer and drinks will be provided. If you will be cooking at the park, please use the designated area to set up your grill. 1 park grill will be available in this area. However, first come, first serve. (Charcoal will not be supplied for the park grill). "Blind" tasting--all ribs will be presented without competitor names. All serving pans must look alike, standard half-size (11 3/4" x 9 3/8") aluminum serving pans. A maximum of 20 people will be official judges (7 judge minimum). Anyone other than a competitor can be an official judge. Judges must be 16 year or older in age. To be an official judge, non-competing attendees can write their names on the sign up sheet the day of the event. 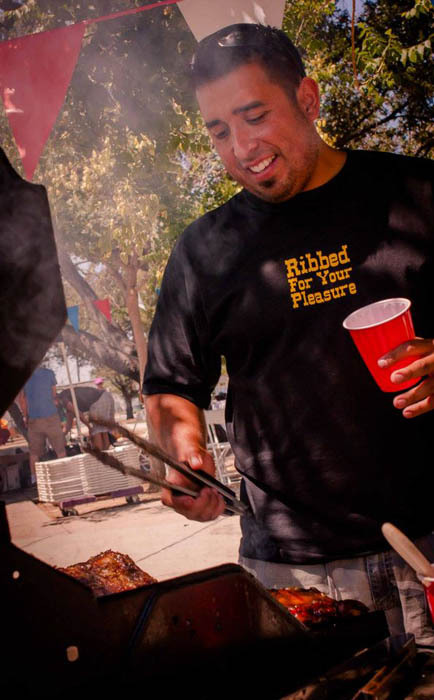 Official judges will be first in line to get 1 rib or piece of each competitor's submission. Official ballots will only be given to each of the judges. Votes will be submitted anonymously in the "ballot box" (judges will not write their names on the ballot). Votes will be tallied publicly on a tally board. Tie breakers will be determined by a rib cooking quiz (person who correctly answers most out of five rib cooking related questions wins). 2 park grills (first come, first serve). Feel free to bring your own grill. 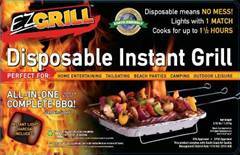 We may have a limited number of Disposable Instant Grills (with charcoal) best used to warm up/glaze ribs. These grills must be used in the designated rib cooking area (see map above). NOT suitable for long cooking times. Standard half-sized aluminum serving pans and foil. Ribs must be submitted in an aluminum serving pan of this size and covered with foil. If you don't bring your ribs in an aluminum pan of the correct size, feel free to take as many as you need. Plenty of bench seating and tables. Feel free to bring your lawn chair for the grass. No kitchen oven, stove, sink, etc.